Last edited by GateWorld; March 8th, 2017 at 08:28 PM. Holy spitballs batman. WHAT a bumber of an ep.. 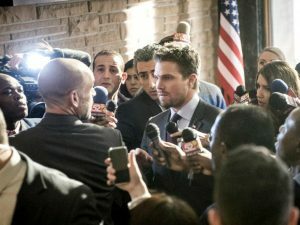 Speedy departs as she realized she is too politician in being so easily pushed to blackmail..
Oli has to toss his alter ego under the bus, to placate the council..
Felicity goes whole hacktivist, and dismisses the warning diggle gave her and joins in with that group.. MAN what a stupid (IMO) decision. However i loved the ribbing Rene was giving Terrific about his "balls"
I thought this was a pretty great episode, I really enjoyed it. I loved the reveal that the DA is Prometheus, I've been hoping it was him pretty much since the beginning. Felicity will probably get in some kind of trouble for joining Helix, but I've been enjoying her arc this season. I'm glad that Susan has decided to keep Oliver's secret. I wonder what Adrian is going to do to her. I hope Thea fixes what she needs to and comes back soon. I'm glad that Susan has decided to keep Oliver's secret. I was actually surprised at that part.. BUT glad they patched it up.. I think even before this big reveal, it was starting to become fairly obvious who Prometheus' identity was. Who else could it have been for the impact to really mean anything? Although, Vigilante came preeeetty close to finishing Prometheus off for good. How shockingly hilarious would have been for Oliver? He also had the rest of Ollie's team totally dead to rights. The only reason they are not all dead was because he decided to do a dramatic pause before finishing Curtis off. Well, she is hot, poisonous and deadly. Last edited by Infinite-Possibilities; March 2nd, 2017 at 06:32 PM. Though that leaves up the idea of WHO Is vigilante?? Who is there that it could be? Last edited by Teddybrown; March 4th, 2017 at 04:09 PM. That is what i thought as well. BUT with this big reveal, that kyboshes that idea..
Ive not read the comics, but Id heard he is Vigilante in the comics.